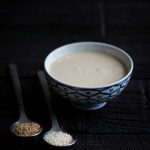 Learn how to make this fast and easy tahini recipe that’s just as good as store brands (it’s even better, in my opinion). 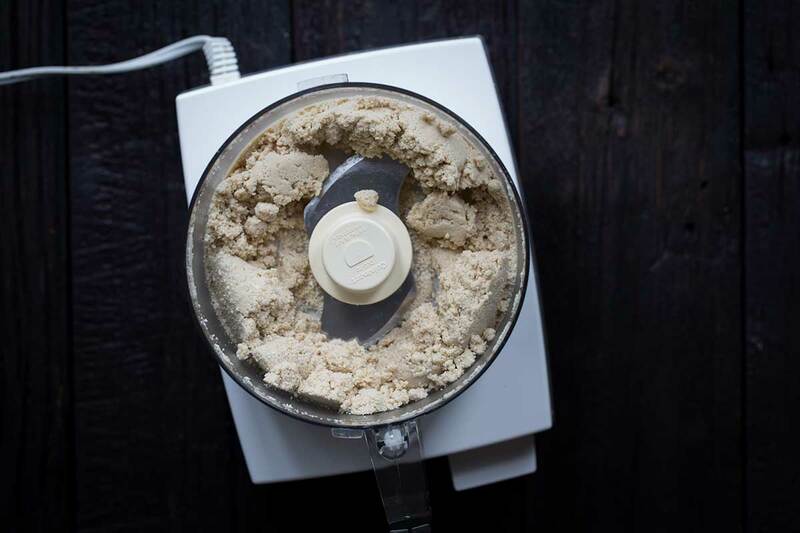 Included is a step-by-step photo tutorial on how to make tahini paste from scratch, as well as numerous suggestions for using it. There are so many ways to use this sesame seed paste aside from just hummus! Tahini is quite possibly one of my favorite ingredients. While people mostly associate it with hummus, I love using it as a creamy element in salad dressings and sauces (similar to how I often use peanut butter). It’s amazing in desserts, and it’s also the ingredient that makes my spicy tahini kale chips so addicting. 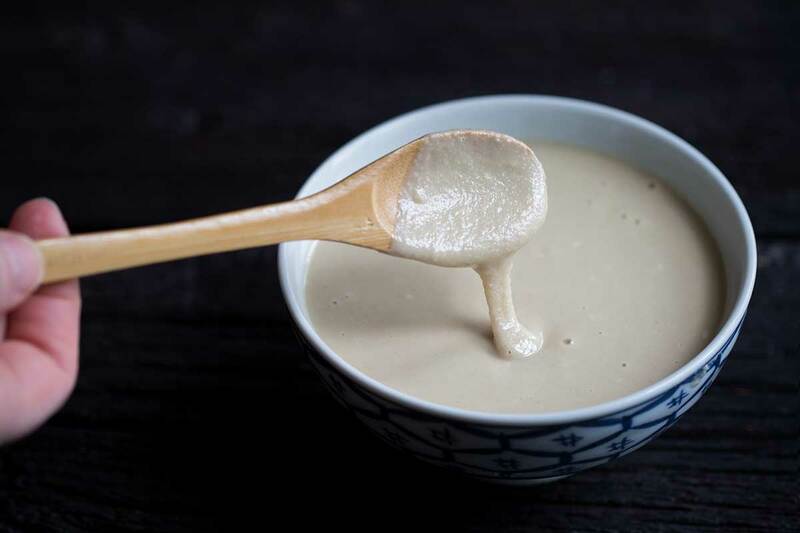 If you’re not familiar with this ingredient, you might be wondering what is tahini, exactly, and what makes it so special? Tahini is a Middle Eastern paste made from ground sesame seeds. A neutral-flavored oil is often added to thin out the consistency, which I have done in this recipe. Tahini can get very pricy at the grocery store, and it can be made at home for a fraction of the cost if you purchase sesame seeds in bulk. Some stores will carry sesame seeds in the bulk aisle. I purchase mine online. Toasted versus untoasted sesame seeds. 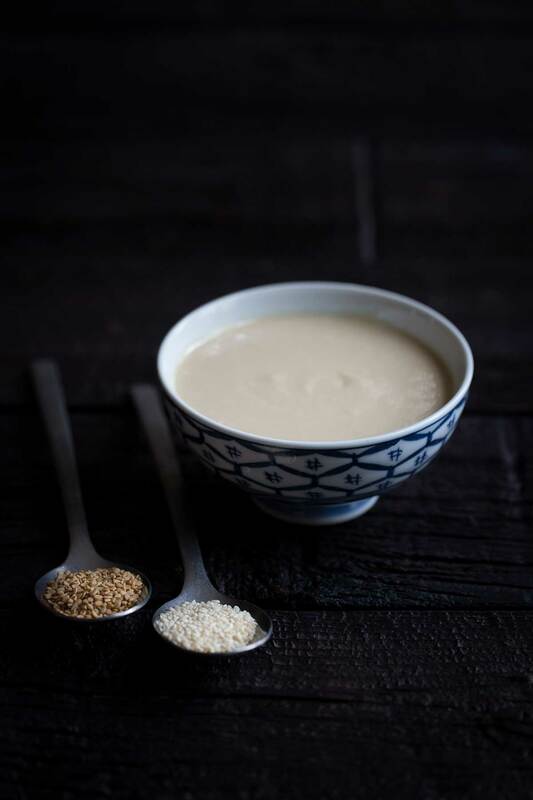 You can make tahini using either hulled or unhulled white sesame seeds. Sometimes you’ll even find recipes using black sesame seeds. Hulled sesame seeds have had the shells (kernels) removed, and will create a creamier tahini with a less bitter taste. 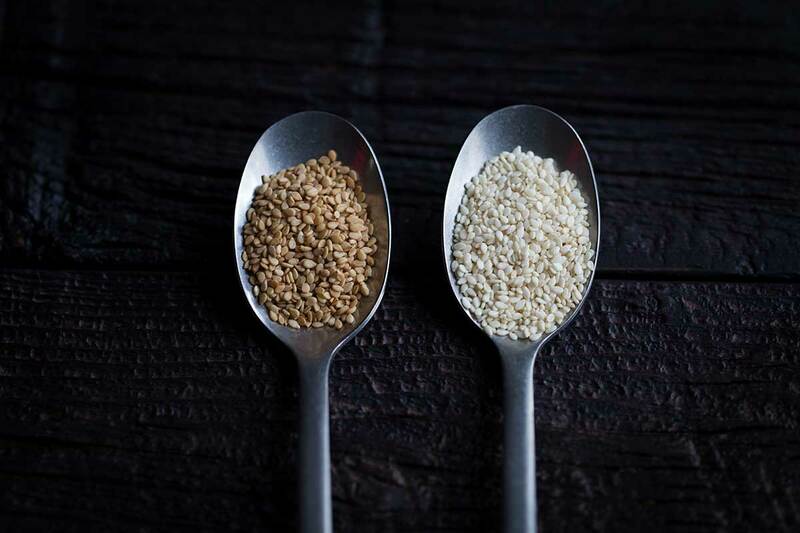 However, unhulled sesame seeds have some added nutritional value, so that may be an important consideration for some! If you see recipes for raw tahini, they are probably using unhulled seeds. Toasting the sesame seeds is not a requirement, and you can make tahini even if you skip this step. But toasting will deepen and enhance the flavor. It will also result in a less bitter aftertaste. Adding some oil to the food processor helps break down the sesame seeds and creates a smoother texture, though you can add a bit less than I’ve used here (or more). The ratio I’ve used will give you a consistency that’s similar to (or slightly thinner) than store brands. You can try starting with 1 tablespoon if you want a thicker tahini. Use a neutral-flavored oil so that the flavor of the sesame seeds can shine. My top pick is grapeseed oil, which can sometimes be expensive at the grocery store, but I find great deals online and at specialty markets. Other good examples of neutral-flavored oils include safflower and sunflower. Peanut oil is usually fine, though sometimes the flavor has a hint of peanuts (which won’t clash with or overpower the sesame seeds). Canola oil is often suggested as a neutral oil, but I think it has an off-putting, synthetic flavor. I can see the temptation to use sesame oil in tahini, but I would advise against it. Sesame oil usually has a very strong, concentrated flavor. Allow the flavor of your tahini to come from the seeds themselves. Learn how to make this fast and easy tahini recipe that’s just as good as store brands! Place the sesame seeds in a medium or large skillet. Set on the stovetop over medium heat and toast, stirring and/or swirling the pan periodically, until golden brown and fragrant, 8-10 minutes. Monitor closely to avoid burning the seeds, but also keep in mind the the more you toast them, the less bitter the tahini will be. Remove from the heat and allow to cool for a few minutes, then transfer to a food processor along with the oil and salt, if using. 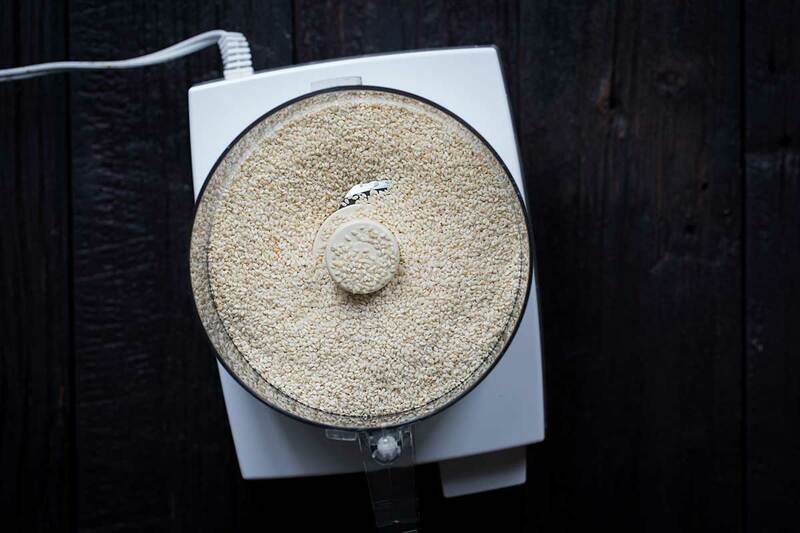 Pulse several times to distribute the oil, then turn the machine on and let it run until the tahini is smooth, 3-5 minutes, scraping the bowl down at least once mid-process. Transfer to an airtight container and store in the refrigerator for up to one month. Yields approximately 1 cup. Grapeseed oil is my top pick when it comes to a neutral-flavored oil for recipes. Safflower oil is also a good choice. Some people recommend canola, which I think has a synthetic flavor. If you’re thinking about using canola oil in tahini, I recommend first tasting a bit so you can decide for yourself. Peanut oil has a mild flavor of roasted peanuts, but that will work in tahini. I purchased sesame seeds online in bulk to save money. Some stores also carry them in the bulk goods aisle. This makes it look so easy! I haven’t had a lot of Mediterranean flavors but this is a must try. 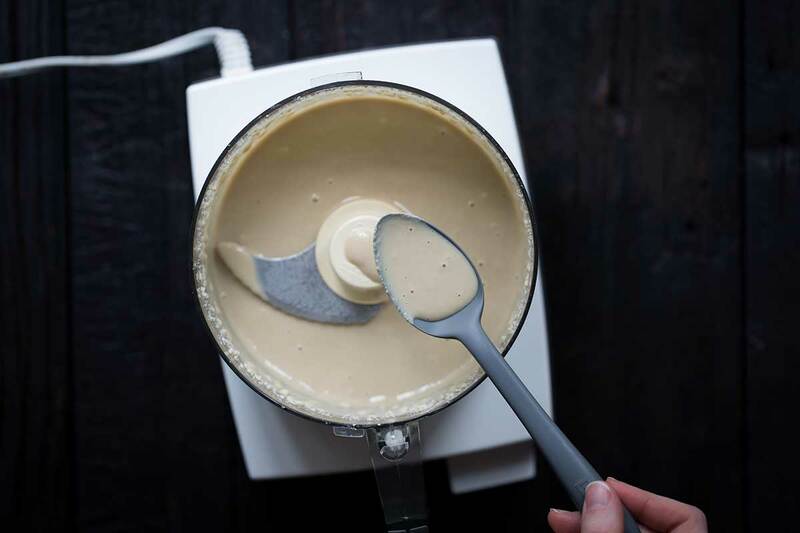 I never thought of making tahini from scratch but it looks PERFECT! I LOVE tahini, yet I have never made it myself! Gotta try this! Mmm I love Tahini and I’ll def have to try this! I never would have thought to make my own! Never even thought of making tahini myself, but it is so much easier than I thought! So many good ideas to use this!! Would avacado oil work with this recipe?